Many palms in coconut plantations in the South Pacific Islands are old and have lost much of their vitality and productivity. Known as senile coconuts, these palms provide only low nut yields. For example, a 25-year-old coconut may produce up to 35 nuts a year while a 60- year-old senile coconut may only provide 4 nuts. In reality, senile coconut plantations are ready for replacement, or conversion to alternative land use. 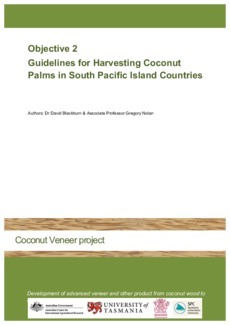 • Harvest and replace senile coconut palms to maintain a sustainable coconut resource base for forecasted future demand. • Implement safe harvesting practices. A rotary peeled coconut veneer product industry is being investigated as an option for the use of logs that will be extracted when senile palms are harvested. If this option proves attractive, strategic operations will need to be considered to address an increasing demand for peeler-logs. Guidelines for harvest log selections, felling, log handling and site rehabilitation are identified and proposed in this document.